News just in from Marc Haendle at Ocean Independence that the price of the 26m motor yacht Cento by Excalibur has been reduced, but you'll have to hurry as it's only valid for 60 days and expires on July 15th 2010. Cento by Excalibur was built by FIPA as part of the Maiora range in 2001 to a design by Roberto del Re. RINA classed and MCA compliant, she sleeps six guests in a master, VIP and double cabin and has a range of 500 nautical miles at 18knots. 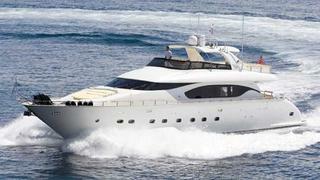 With a successful charter record behind her, this superyacht has the all-important Spanish charter licence. Previously asking €1.75 million, her new limited period price is €1.595 million.